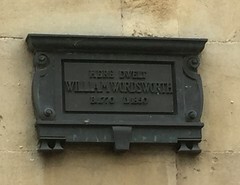 William Wordsworth (7 April 1770 – 23 April 1850) was a major English Romantic poet who, with Samuel Taylor Coleridge, helped to launch the Romantic Age in English literature with their joint publication Lyrical Ballads (1798). Wordsworth's magnum opus is generally considered to be The Prelude, a semiautobiographical poem of his early years that he revised and expanded a number of times. It was posthumously titled and published, before which it was generally known as "the poem to Coleridge". 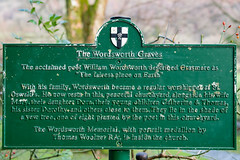 Wordsworth was Britain's Poet Laureate from 1843 until his death from pleurisy on 23 April 1850. 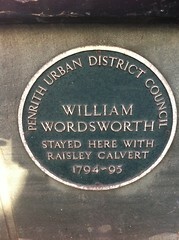 William Wordsworth stayed here with Raisley Calvert 1794-95. Stricklandgate House. This house was built about 1776 by Joseph Maude, a Kendal banker and for many years housed the Kendal Savings Bank. 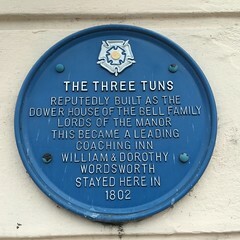 In 1854 it was leased to the Kendal Literary and Scientific Society of which Wordsworth and Southey were Founder members and became the town's museum and library. Ancient Monument Anne Tyson's Cottage Wordsworth Lodge The poet William Wordsworth lived here whilst a scholar at the Grammar School (1779 - 1787). 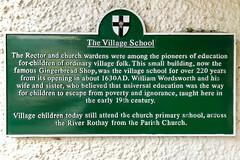 The Chapel where the poet occasionally worshipped was up the steps on the left of the cottage.